S100 Total Cycle Finish Restorer is a multi-surface metal polish for motorcycles. Removes scratches from paint and plastics. Great for small scratches, stains and imperfections. 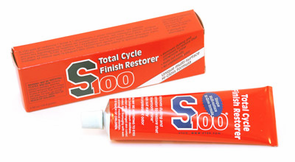 S100 Total Cycle Finish Restorer is called 'total cycle' because it can literally be used all over your motorcycle. As a metal polish, S100 Total Cycle Finish Restorer removes tarnish and polishes metal to a bright shine. As a paint restorer, S100 Total Cycle Finish Restorer removes fine scratches. As a plastic polish, S100 Total Cycle Finish Restorer removes scratches and improves color. S100 Total Cycle Finish Restorer is excellent for spot polishing. Because it's useful on so many surfaces, S100 Total Cycle Finish Restorer may replace multiple other products in your garage, which saves you money. Apply S100 Total Cycle Finish Restorer with a soft foam or microfiber applicator and rub over the desired area. Buff off residue with a soft microfiber cloth. For metal polishing and spot repair of paint and plastic, choose S100 Total Cycle Finish Restorer. This stuff will remove a scratch. Really! I purchased a tube of S100 twenty years ago to see if it would remove some clearcoat scratches (from a belt buckle!) on my motorcycle's fuel tank. It didn't cost much, so it was worth a try. To my surprise, it worked better than I'd expected. Following the directions and working through five or six applications and buffings, the damage was invisible. I kept that tube around and removed scratches on cars - scratches I really didn't think would be repairable. Even deeper marks, such as door dings, were greatly reduced and were hardly noticeable. I finally used it up, and recently bought this fresh tube online - my local motorcycle store doesn't sell it. ConsNo real cons, just some advice: Don't keep it in the garage. It'll dry out once you open the tube for the first time. Don't apply it to a wet car or motorcycle, it'll just smear ineffectively. There is enough abrasive compound in it such that you can get results using just a washrag and hand pressure, so don't attempt to use it with an electric buffer - you'll buff off the clearcoat.